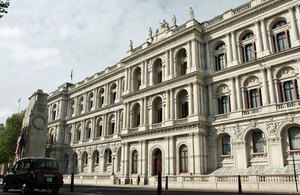 UK calls for the Azerbaijan government to support freedom of expression, and the right to a fair trial. On 10 August, an investigation into alleged tax evasion was launched against the independent Turan news agency in Azerbaijan. The director of the agency, Mehman Aliyev, was detained on 24 August in connection with the investigation. On 25 August, Turan announced that it was suspending operations indefinitely from 1 September, shortly before Mehman Aliyev’s pre-trial detention was confirmed. The UK is concerned by the criminal case against the Turan news agency in Azerbaijan and the pre-trial detention of its director Mehman Aliyev. This represents the latest development in a worrying trend of apparently politically motivated actions to curtail freedom of expression and restrict independent media. The UK will continue to monitor developments in this case and urges the Azerbaijan government to uphold its commitments to fundamental freedoms, human rights and the rule of law, including Mehman Aliyev’s right to a fair trial.